You’ve probably never heard of a company called 2GIG Technologies or the Go!Control, but they are really starting to make a name for themselves in the interactive home security system arena. 2GIG has developed what we consider to be the iPhone of home security systems and it is the heart of the Burns & McBride Smart Safe Home system. They have grown to be the second largest manufacturer of home security systems in the past three years and the unit was just awarded a Consumer’s Digest Best Buy award. The Go!Control panel is one of the most intuitive, feature-packed, well designed home security systems that we have ever dealt with. The first thing that catches your eye is its’ clean looks. There is no numeric keypad instead it has a bright LCD touchscreen instead. Our basic Smart Safe Home kit comes with 3 wireless door / window contact sensors, a motion sensor, a keyfob for arming and disarming the system, a Honeywell “Smart” thermostat, yard sign, the main control panel itself, a power adapter and battery, and a cellular card that installs into the control panel. The unit is backed by a one year parts and labor warranty plus Burns & McBride backs the unit with aits own 100% Satisfaction Guarantee. If you are unhappy with the performance of the unit, and we are unable to satisfy you, we will remove it at no charge within one year of installation and refund your money. That’s how strongly we believe you’ll like the unit. The device does not need a standard telephone line since it comes with a built in cell phone. Your alarm cell service cost is built into your monthly alarm service fee. The system will be installed by a trained, licensed Burns & McBride technician. The touchscreen experience is much more intuitive than the old school keypads offered by other security system providers. In addition to the touchscreen, the system also features a large fire/emergency buttons in the event that you are too panicked to fiddle with the touch screen. It also features a home button that takes you back to the main menu similar to the home button on an iPhone. 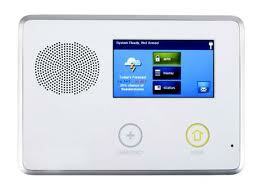 The system features voice responses for just about every event, such as opening a door. You can build your own custom voice responses by stringing together words found in the built-in word bank. The system is highly expandable. You can easily add other sensors such as smoke/fire and glass break sensors at any time.